I had the pleasure of interviewing our Brand Ambassador, Jasmine Reeder (JR) recently and these are some of the highlights of our interview. Big think you to Jasmine for her time and for always making me smile! 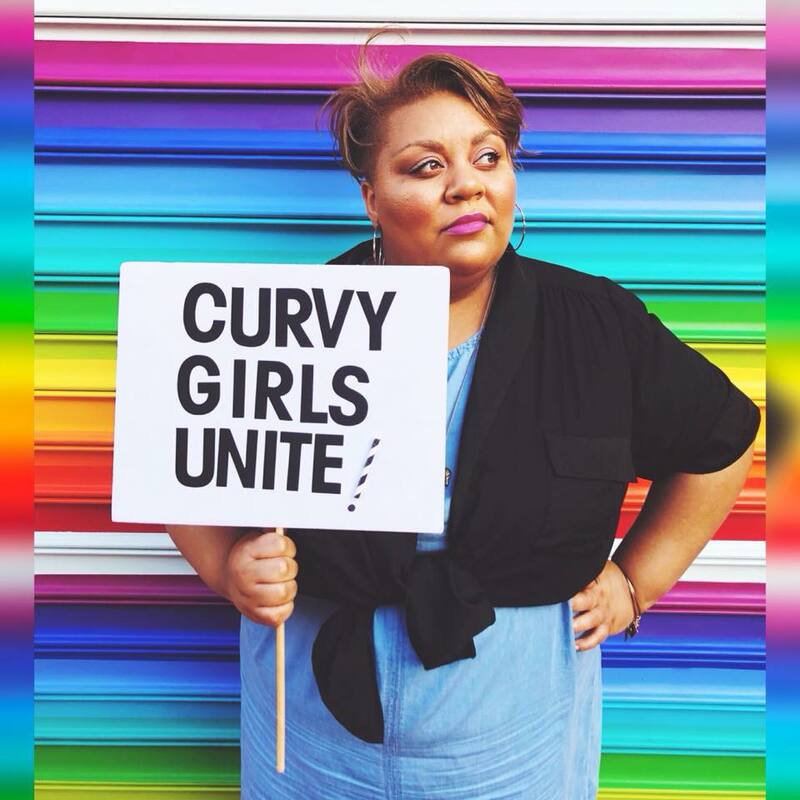 Jasmine is the founder of Curvaceous Lush and one of our advisors here at 21Squared. Jasmine was in town recently and she hosted a Curvy Girl Networking event. Read more about that event in San Francisco here. CB: How did you get inspired by fashion? When did your interest in fashion start? JR: I was inspired by fashion as a young child through my grandmother. She always had her own style, and wouldn’t play by anyone’s rules. If she wanted to wear a fierce hat, she would wear a fierce hat. I would always dress up in my grandmothers work clothes, and sneak into her room to play with all of her fabulous accessories. My interest in fashion started in my early teens, since being a plus size teenager there were no real options for me, and I just wanted to be able to express my style like everyone else. So I started to create things/clothing that the projected my own personal style. CB: Who are your fashion heroes? JR: I love Christian Siriano. I think he is really doing great things in the fashion industry by including all shapes and sizes during his fashion week shows. Also the designers behind the brand Chromat. I also look to Tess Holliday for fashion inspiration as she is always rocking her genuine style, and I love it!! CB: What do you love about our app? JR: I love the sense of community the app gives. I also love that it showcases real everyday women. We have to see airbrushed, photoshopped images of women on a daily basis. So it’s great to be able to log into a space, where we can see women who are NOT photoshopped. CB: What problems/issues does the app solve if you are a woman of size? JR: It takes out some of the guesswork of wondering how the clothing will look on you. Just the other day I was scrolling on the Nordstrom website in the plus size section, and they had not one plus size model modeling the plus size clothing! I was so irritated I closed my browser. Brands have got to do better! CB: Who are your favorite fashion designers? CB: What advice would you give woman of size about fashion and shopping online? JR: Read the reviews! Reading the reviews both good and bad, give you a sense of the garment before purchasing. Also, buy more than one size if you are buying for something important like an event etc. And, use the 21Squared app to help you make a good buying decision. CB: Where is the most fabulous place you have even traveled? What is your dream vacation? My dream vacation would be to travel around Italy for a month. In college I studied Italian language and culture, but have yet to visit the country yet. I’m dying to go! CB: What would you like to see in the next 5 to 10 years for women of size? JR: I want there to be more of an overall acceptance of women of size. Yes, we have come a long way but we still have a ways to go. I also want to be able to go into a store and feel confident that they have something for me there. Currently there are very few options where we can shop in a brick and mortar store in our size. Hopefully by now you have downloaded our app and put it on your iPhone. We feel like it’s a very useful tool for women of size who are shopping online and have ever been frustrated by not getting the right size the first time. (Everyone dislikes returning stuff!) Our app is also a fabulous way for consumers and Influencers to make money. It’s super simple, too. You just take the pics you already have of you in your fabulous fashions and you post it on our app and with a link designer. When other consumers buy via your link, you get paid a commission. Our app takes all of the guess-work out of shopping online because you get to see the fashion on other women who have a similar body type to your own before you buy it. You can see how it fits on bodies that are 50% or more similar to your body.